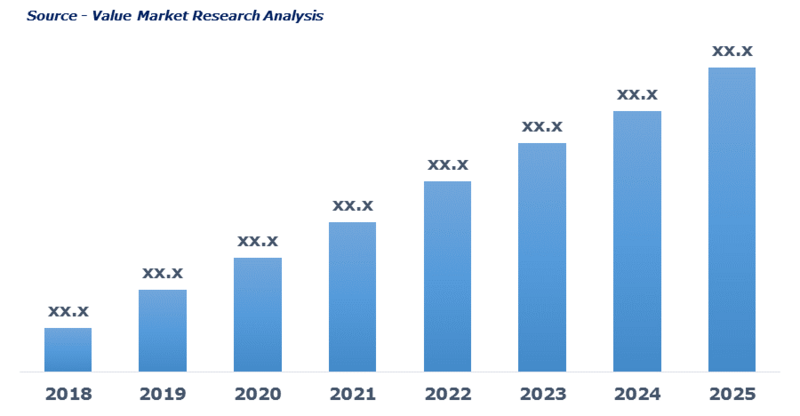 Rising demand from the healthcare sector to cure chronic and neurogenerative disorders are driving the market growth. Increasing count of the population suffering with bipolar disorder, Alzheimer and multiple sclerosis is further boosting the cannabidiol demand. In addition to this, growing popularity owing to wellness ingredient is spurring the market growth. The rising number of players owing to more relaxed legislation on the usage of cannabidiol in sports nutrition, medicines, cosmetics, and pet care product has triggered the market growth. In relation to this, approval of cannabidiol as a first oral drug by FDA for a rare and severe form of epilepsy is again boosting the market grow. The latest report by Value Market Research expects the Global Cannabidiol Market to reach USD 10,280.2 million by 2025. It was valued USD 1,396.5 million in 2018. The report foresees a 33% CAGR from 2019 to 2025. In 2018, pharmaceutical grade emerged as the leading product segment by accounting major share. Use of cannabidiol based medicines for curing bipolar disorder, epilepsy, Alzheimer and other neurological disorders are driving its demand. Also, rising application of cannabidiol in oils, powders, supplements, & high concentration extracts to cure other aliment is again boosting the market growth. Fibromyalgia has dominated the application segment in 2018 owing to the rising count of patients suffering from physical or emotional trauma, physiological stress, and surgery are driving the segment growth. Along with this, lack of exercise, sedentary lifestyle, poor diet and improper sleep cycle are some of the prominent factors driving the segment growth. North America has dominated the regional market in 2018. Growing geriatric population followed by rising in patients’ with neurogenerative, musculoskeletal and other aliments are driving the demand of cannabidiol-based drugs. Also, the rise in cultivation of marijuana plants, a result of liberal policies on the sale of cannabidiol is again pushing the regional market growth uphill. Aurora Cannabis, Canopy Growth Corporation, CBD American Shaman, CV Sciences (CV Sciences, Inc.), Elixinol, Folium Biosciences, Gaia Botanicals (Gaia Botanicals LLC), IRIE CBD, Isodiol (Isodiol International Inc), NuLeaf Naturals (NuLeaf Naturals, LLC.) and PharmaHemp (Pharmahemp d.o.o.) are some of the major players of cannabidiol market. As per this study the Global Cannabidiol Market was valued USD 1,396.5 MN (by revenue) in 2018 and is anticipated to reach USD 10,280.2 MN by 2025 with a CAGR of 33%. Cannabidiol (CBD) is a phytocannabinoid compound extracted from cannabin sativa plant or marijuana. Cannabidiol is anti-inflammatory, anti-oxidant, analgesic compound that act as neuro and immunoprotector in various medical conditions. CBD is used in potential treatment to cure epilepsy, fibromyalgia, chronic polyarthritis, and Neurogenerative conditions such as Parkinson’s disease, multiple sclerosis and others.